Since the introduction of the Control of Asbestos at Work Regulations 2002 there has been a requirement to manage the risk from asbestos in all non-domestic premises. The Regulations were amended in 2006 and further amendments were introduced in 2012. The Control of Asbestos Regulations 2012 requires asbestos to be identified and assessed. The principle method of identification is through an asbestos survey or inspection. The key to managing asbestos is to identify the location, type, condition and extent of any asbestos containing materials (ACMs). This is achieved by conducting an asbestos survey that must be undertaken in accordance with HSE guidance note HSG 264. The HSE’s publication ‘HSG 264 Asbestos: The Survey Guide,’ refers to two different types of survey: asbestos management surveys (previously known as a Type 2 asbestos survey) and asbestos refurbishment & demolition surveys (previously known as a Type 3 asbestos survey). An asbestos management survey is the standard survey. Its purpose is to locate, as far as reasonably practicable, the presence and extent of any suspect asbestos containing materials (ACMs) in the building which could be damaged or disturbed during normal occupancy, including foreseeable maintenance and installation, and to undertake an assessment of their condition. Asbestos management surveys will often involve minor intrusive work and some disturbance. The extent of intrusion will vary between premises and depend on what is reasonably practicable for individual properties, i.e. it will depend on factors such as the type of building, the nature of construction, accessibility etc. An asbestos management survey should include an assessment of the condition of the various ACMs and their ability to release fibres into the air if they are disturbed in some way. This ‘material assessment’ will give a good initial guide to the priority for managing ACMs as it will identify the materials which will most readily release airborne fibres if they are disturbed. This type of survey is required before any refurbishment or demolition work can be carried out. The survey is used to locate and describe, as far as reasonably practicable, all ACMs in the area where the refurbishment work will take place or in the whole building if demolition is planned. A refurbishment and demolition survey may also be required in other circumstances, e.g. when more intrusive maintenance and repair work will be carried out or for plant removal or dismantling. This type of asbestos survey is fully intrusive and involves destructive inspection, if necessary, to gain access to all areas including those that may be difficult to reach. Refurbishment and demolition surveys should only be conducted in unoccupied areas to minimise risks to the public or employees on the premises. Ideally, the building should not be in service and all furnishings removed. For minor refurbishment, this would only apply to the room involved or even part of the room where the work is small and the room large. Under no circumstances should staff remain in rooms or areas of buildings when intrusive sampling is performed. Selection of the type of asbestos survey most appropriate is made at the initial planning stage and is dependent upon your specific requirements and the particular circumstances of the property concerned. In order to ensure that materials that may contain asbestos are not accidently disturbed, it is important to either take reasonable steps to find materials likely to contain asbestos through sampling, or to presume that the materials do contain asbestos. Presumption is a satisfactory method of management however, if you are planning to disturb the material through planned works then it is important that you know the type of asbestos to avoid unnecessary costs for removal. It may also be necessary to identify asbestos prior to a house purchase so that any future removal costs can be shared with the current owner, or to satisfy your mortgage company. 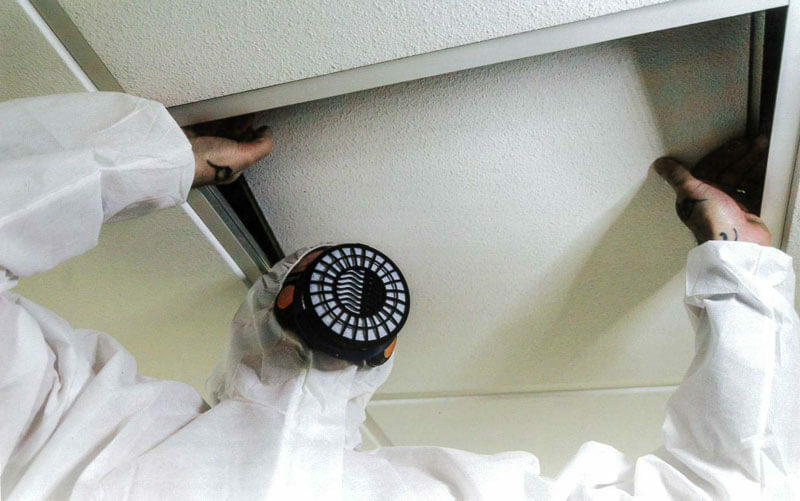 To avoid potential exposure and damage to asbestos, testing should only be undertaken by experienced individuals who have the necessary asbestos training. All samples will be analysed by a UKAS accredited laboratory. The Control of Asbestos Regulations 2012 states that all duty holders with known or presumed asbestos within their premises must have an effective written asbestos management plan in place. The asbestos management plan identifies the risks posed by the asbestos present in the property and sets out procedures to control them. Policies and procedures for emergencies, refurbishments, day-to-day operations and for less usual work or tasks. The key to effective management is to ensure that the action plan is monitored and reviewed on a regular basis. All types of asbestos air sampling undertaken by a UKAS accredited analyst.